By the time the Vikings picked at No. 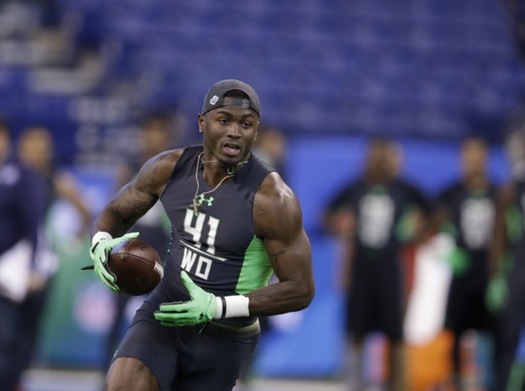 23, Laquon Treadwell was the obvious choice for both value and need. He was the popular choice, but not the kind of choice GM Rick Spielman typically makes. Shortly before the Vikings made the 23rd pick in the first round of the draft Thursday, KFAN radio host and Vikings play-by-play announcer Paul Allen queried the crowd in attendance at the team’s draft party at the Minneapolis Convention Center. He first asked how many of them wanted the Vikings to choose UCLA linebacker Myles Jack. The applause was noticeable but not overwhelming. Then he asked if they wanted the Vikings to take Ole Miss WR Laquon Treadwell. The sound was a roar — a full 80 percent of the thousands in attendance, I would guess. And a few minutes later, when Treadwell was announced as the pick, the roar grew even louder. The point of this: by the time the Vikings picked at No. 23, Treadwell was the obvious choice for both value and need. He was the popular choice with fans because he plays an exciting position. But he wasn’t necessarily the kind of choice Vikings GM Rick Spielman has made in recent years. Spielman often has eschewed the obvious by trading up, down and all around the first round (as well as subsequent rounds). Between 2012 and 2015, he made 13 trades during the draft, some to accumulate his coveted 10 total picks and some to add extra first-round picks — blue chip talents who also have that fifth-year contract option he clearly covets. The wheeling and dealing has generally been positive. The results of the players he has chosen has been more of a mixed bag, though there is plenty on the good side when you consider the Vikings are coming off an 11-win season with a young roster that is the envy of plenty of organizations. Last night, Spielman — based on his history — surely was tempted to deal that No. 23 pick to another team starved for a wide receiver or some other coveted player. But in speaking with reporters after the pick was made, the Vikings GM laid out his reasons for going off-script by being predictable. Again, that might sound somewhat basic and obvious. But still: kudos to Spielman for recognizing there is a time to deal and there is a time to be patient and take a player who can help in both the near-term and long-term. The Vikings are a team with deep playoff aspirations and plenty of free agents set to play in 2016. Now is not the time to get cute or risk quality for the sake of quantity. That’s not to say Spielman couldn’t get both sometime during the next two days of the draft. But with the way round 1 played out, the Vikings handled it exactly as they should have.